Thinning hair can be embarrassing and when your hair thins in the front, it feels more obvious and can seem harder to cover up. However, thinning front hair is not impossible to disguise. By slightly altering things such as hair color or by simply wearing your hair in a different style, you can cover up balding areas or problem spots. Dye your hair a lighter a shade or two lighter than your natural hair color. Lighter hair colors blend and disguise thinning areas of the hair better than darker shades of hair, which can also look stringy and flat. Avoid bleaching or over-processing your hair. Cut your hair shorter than you normally wear it. Shorter styles add more volume and make the hair look thicker while longer lengths weigh down your hair, highlighting balding areas. Start out by cutting your hair a few inches shorter than normal. Gradually decrease your length to a short style you feel comfortable with. 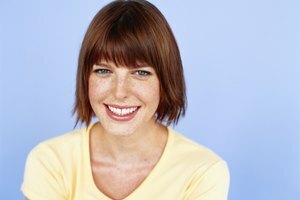 Cut bangs into your hair if you do not feel comfortable cutting all of your hair short. The bangs will disguise thinning areas in the front of your hair. 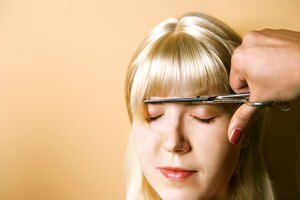 Cut a large bang that starts toward the center of your head or cut bangs that you can part at the side. Wear hair accessories. For example, part your hair differently in the front and pin a few strands back with a small barrette or hair comb. Part your hair so it covers up the balding area and creates an illusion of thicker hair. Parting your hair differently and wearing hair accessories gives you the option of keeping your hair length and current hair color. Wash your hair with thickening shampoo and conditioner. Style your hair with products designed to add volume and thickness. After styling your hair, use a light hairspray to keep it in place. Find out why your hair is thinning. Consult a doctor and get to the root of the problem. 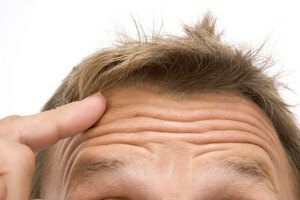 Hair thinning can be due to genetics, hormones and age, as well as health problems such as those related to the thyroid.